As the crisis developed, mainstream economists, the Federal Reserve, and Federal government officials tried to explain away the problem. When the problems in the mortgage market began in 2006, they said that it would be “contained” to so-called sub-prime mortgages made to borrowers considered to poor credit risks. Then the housing market as a whole began to sink, and they said that it wouldn’t cause a recession. As the economy began to lose jobs and the recession started, they said that Europe and Asia would be fine and that our exports to the rest of the world would help the United States. Finally, when the financial crisis exploded on Wall Street and shook the world economy, the Federal Reserve and Federal government jumped into action and the finger pointing began. With interest rates already near zero in a failed attempt to combat the recession, the Federal Reserve went on a lending spree, pumping about a trillion and a half dollars into banks, financial institutions, and bond markets. The Federal Government has cut taxes, loaned hundreds of billions of dollars to bailout banks and other financial institutions, and increased spending on social programs and infrastructure, leading to a trillion and a half dollar federal budget deficit for the 2009 Fiscal Year. The dominant free market school of economics reeled in shock as the capitalist system teetered on the edge of calamity. They saw the economic crisis as unthinkable and impossible and tried to blame it on the government, overlooking the fact that the government had pursued their policies of deregulation, free trade, and cuts in social programs for the last thirty years. But while the economic debate between the free-marketers and Keynesians heated up, both sides have ignored the only school of economics that actually explained why recessions and economic crisis are a regular feature of capitalism instead of explaining it away or trying to figure out how to save the system. This school is Marxism, based on the economic analysis of Karl Marx, V.I. Lenin, and others. But unlike the kings and emperors of ancient and medieval times, the capitalists today do not spend their all their wealth on luxuries, temples, and armies. While they do live lives of luxury, most of their wealth is reinvested into expanding their businesses. This accumulation of capital also contributes to the rapid technological advances under capitalism, as the capitalists use their wealth to develop new innovations that they hope will help them compete with other capitalists. But these processes of exploitation and the accumulation of capital lead to a fundamental contradiction: exploitation and the capitalists’ drive to lower wages, limits the ability of the masses of workers to consume. At the same time, the accumulation of capital and technological innovation are constantly increasing the ability of capitalist businesses to produce. This contradiction between reduced ability to consume and the increased ability to produce leads to periodic crisis of overproduction, or what is generally called a recession. Such a crisis of overproduction can be seen around us: stores are closed and factories are idle. Homes stand empty and goods pile up unsold. At the same time workers are laid off, getting evicted from their homes, and suffering from cuts in government services and public schools. These crises of capitalism also pave the way to recovery. As businesses close down, means of production are destroyed, reducing the excess capacity to produce that helped to lead to the crisis. At the same time new markets can be found, restoring the ability of the capitalists to sell their products. This restores economic growth, which in turn recreates the conditions for another crisis of overproduction. Thus there is a pattern of economic expansions followed by recession, or what is known as the business cycle. Here in the United States there is a recession every five years on average. The U.S. economy is in the 33rd official recession since 1857 . Last, but not least, Lenin criticized the idea that the growing international ties among capitalist nations would lead to more harmonious relations. Instead he pointed out the growing competition and conflict among the imperial powers for control of raw materials, markets, and opportunities to invest. These conflicts exploded into World Wars I and II. Today there are also mistaken theories that capital is now transnational and that national governments don’t matter as much. But the reality is that economic contradictions are growing among countries, especially the rising economies of the so-called “BRIC” (Brazil, Russia, India, and China) and the established economic powers of the United States, Western Europe, and Japan. There are also growing protectionist barriers to trade and investment in the wake of the economic crisis in the United States and other countries. National oppression contributes to economic inequality in the United States. Many of the poorest communities in the United States are on Native American reservations, Texan towns where the Chicano Nation borders Mexico, etc. The long-standing relative poverty in the South is rooted in the national oppression of African Americans and the African American Nation. The Great Depression was only overcome by the gigantic destruction of capital during World War II and stimulus to the economy of the reconstruction efforts. Continuous military spending on the Cold War with the socialist countries and wars to suppress national liberation struggles in Korea and Vietnam also stimulated the economy. There was also the relatively cheap and abundant land and energy that drove a wave of suburbanization, stimulating construction, auto manufacturing, and other industries. These combined to create an economic boom in the United States. The role of the Federal government also changed with the Great Depression and World War II. Earlier, it played little direct economic role. But beginning in the 1930s the Federal government, began to play a much larger role in regulating industries, especially banking, in social welfare programs such as social security, and in the allocation of credit through the Federal Reserve bank and mortgage lender Fannie Mae. This was in addition to the economic stimulus of vast military spending. But by the 1970s, many of the factors leading to the post-war boom had played out. The reconstruction of western Europe and Japan was completed and these countries played an increasingly competitive role. The era of cheap energy came to an end with the decline in U.S. oil production and the maturation of OPEC into an effective bloc against US and other imperialist oil corporations. This led to renewed economic crisis and a decade of Stagflation (combination of rising inflation and rising unemployment) during the 1970s. There are also differences among the imperial countries. During the 19th century Britain was the leading imperialist country with a leading economy, the largest empire, and greatest ability to project military power through its navy. However World Wars I and II weakened Britain, and the United States became the leading imperial country after World War II. The U.S. economy was dominant with the other major capitalist countries (Britain, France, Germany, Japan, and Italy) heavily damaged by the war. The U.S. had the largest military, which was armed with nuclear weapons. As the struggles of colonial people forced the European powers to shed their colonies, the United States moved in with neocolonial relationships that it had long practiced in Latin America. The 1970s was a turning point for U.S. economic hegemony. At that time China pointed out that “Countries want independence, Nations want Liberation, and the People want Revolution.” The U.S. empire was battered as national liberation struggles, in particular the heroic struggle of the Vietnamese people showed the limits of U.S. military power. The rise of OPEC (Organization of Petroleum Exporting Countries) meant an end to cheap oil that had helped to fuel the post-World War II economy through construction of suburbs, a growing auto industry, and related travel industries such as tourism. The struggle of African Americans for equality and power inspired other oppressed nationalities and the working class to greater struggle. In addition, the recovery of Japan and western Europe from World War II meant more competition for the U.S. economy. The United States was able to slow its relative economic decline in two ways. One was through “Reaganomics” in the 1980s, which included union busting, deregulation of banking and industry, breaking down protective tariffs. The end result was to lower the value of labor power and increase the profits of the monopoly capitalists. The other was the demise of the Soviet Union and eastern European socialism in the early 1990s. This opened up new markets for the monopoly capitalists, removed a major obstacle to U.S. military intervention in the world, and dealt a blow to socialism and the workers’ movements. One of the features of capitalism noted by Marx was that each resolution of a crisis laid the groundwork for an even greater crisis. After the dot-com bust following the internet boom, speculative capital flowed into the mortgage market, fed by historically low interest rates set by the Federal Reserve. The boom and then bust in the housing market led to both a recession, and then a financial crisis not seen since the Great Depression of the 1930s. 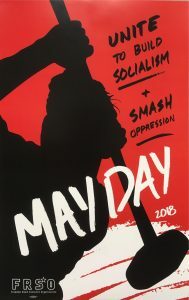 The main features of the current economic crisis are first, the increased exploitation of the working class, cuts in government services, and schools, and generally lower standards of living as the capitalist try to shift the burden of the crisis on to the working class and oppressed nationalities. Unemployment and home foreclosures continue to rise. A vicious cycle develops where jobless workers fall behind on their debt payments, and then are denied jobs because of their bad credit! More and more people are losing health insurance as businesses cut benefits and individual plans become too expensive. Homelessness is growing and mothers and children are being thrown off of TANF and into the streets due to 5-year limits. At this time (April, 2010), it is clear that most sectors of the economy have bottomed out, with state and local governments and schools the major exception. At the same time the economy is still in a deep hole. Jobs are coming back, but it will take years to make up the 8.4 million jobs lost in the recession. Housing sales and prices are no longer trending down, but there are millions of vacant homes. But these “green shoots” of recovery heralded by economists and politicians are all too dependent on the government. Forty percent of new mortgages are being made by the Federal Housing Authority and the Veterans Administration, and sixty percent of mortgages are being bought, turned into bonds, and resold to investors by Fannie Mae and Freddie Mac, both of whom have been taken over by the Federal Government. The Federal Reserve is buying a half a trillion dollars of Federal and mortgage bonds to try to keep capital flowing. Unemployment insurance benefits have been extended from the standard six months to more than a year and a half, etc. The chances of a strong economic recovery, last seen following the 1981-1982 recession, are slim. That recovery followed more than a decade of stagflation. Interest rates were lowered, and a new, pro-business Reagan administration was in power. Most of all, the massive build-up of debt had just began, and with it the ability to juice the economy. None of these conditions exist today: the crisis is less than two years old with massive overcapacity. Interest rates are already at zero. Debt is now so large that it is a major drag, not a stimulus for the economy. This leaves the possibility of a “double-dip” where the economy takes another sharp drop. There are a number of factors that could lead to this. One is that further cuts in consumer spending due to rising unemployment and tighter credit could cause another wave of cuts by businesses. Another possibility is that the Congress, driven by fear of deficits, cuts back on government spending, and/or the Federal Reserve gets spooked by inflation and raises interest rates. This is what happened in 1937-1938, where after four years of recovery, the economy took another step down during the Great Depression. There is also the possibility of another financial crisis, this time driven by bad loans in business real estate. Cuts in state and local government services and public schools, not seen the Great Depression, could also push unemployment even higher. At the same time, the monopoly capitalists are also regrouping and laying the groundwork for new assaults on the working class and oppressed nationalities to shift the burden of the economic crisis on to their backs. There is growing clamor about the weakness of the U.S. dollar and growing Federal government budget deficit from bankers and the Right-wing. They want to start raising interest rates and cut government spending and institute a new period of austerity by further assaults on reforms won in the 1930s and 1960s (social security, Medicare, and home ownership). But no matter what the monopoly capitalist do and say, the current economic crisis has shaken confidence in the capitalist system. Opportunities for educating people about the true nature of monopoly capitalism are growing. At the same time this also is a good time to point to the need for socialism, a system based not on the profit of privately owned corporations, but one based on serving the needs of the working people through government and collective enterprises. China’s economy, with large government owned enterprises and banks, government control of foreign capital flows, and a large domestic market, was able to continue growing, However, China does have a very large export sector linked to the world capitalist economy, which took a big hit and caused economic growth to slow substantially. Cuba’s economy has been hit much harder by a dramatic fall in trade combined with massive damage from three major hurricanes last year. The world economic crisis had a bigger impact on Cuba as compared to China due to Cuba’s relatively larger export and foreign direct investment sectors. Named after economist John Maynard Keynes, whose 1936 book The General Theory of Employment, Money, and Interest, pointed out the possibility of economic crisis and the need for government spending to get capitalism going again. Top Heavy: A Study of the Increasing Inequality of Wealth in America, by Edward N. Wolff, Twentieth Century Fund Press, New York, 1995. For example, the wages of workers in the United States has historically been higher than other capitalist countries. The origins of the United States as a European settler state has meant that the relatively large amount of land taken from indigenous people has provided a (relatively) high standard of living for white farmers, and the reserve army of labor has had to come largely from immigrants and African Americans. The victories of mass struggle during the Great Depression increased workers wages, benefits, and government benefits. The high level of education required for more and more jobs increases the value of labor power to support a longer period in school. In 2000, right before the 2001 recession, the median household income in the United States was $52,500. In 2007 the median household income was $52,163 (adjusted for inflation). Income, Poverty, and Health Insurance Coverage in the United States: 2008, table A-1, page 29. From 2000 to the peak in 2006, corporate net operating surplus (the broadest measure of corporate profits, before interest expenses and taxes) rose from 9.2% to 11.4% of GDP, a 25% increase. When other forms of income from property (proprietors income and rent) are included, it came to almost 21% of GDP in 2006. Note that the total share of income from property and exploitation is even higher, since this figure does not include high salaries and benefits going to top managers and administrators whose pay comes from the surplus extracted from exploitation. The dates for recessions are set by the Business Cycle Dating Committee of the National Bureau for Economic Research (NBER). The historical dates can be found at <www.nber.org/cycles/cyclesmain.html>. Note that “The NBER does not define a recession in terms of two consecutive quarters of decline in real GDP. Rather, a recession is a significant decline in economic activity spread across the economy, lasting more than a few months, normally visible in real GDP, real income, employment, industrial production, and wholesale-retail sales. For more information, see the latest announcement from the NBER’s Business Cycle Dating Committee, dated 12/01/08.” (quoted from the web site cited above). In 2002 the four largest breweries in the United States held 90.8% of the market (2002 Economic Census. Sector 31: Manufacturing: Subject Series – Concentration Ratios: Share of Value of Shipments Accounted for by the 4, 8, 20, and 50 Largest Companies for Industries: 2002. Row 427. Since 2002 concentration has increased as the single largest U.S. beer company, Anheiser-Busch, was recently bought by the Belgium-Brazilian giant Inbev. In addition the next two largest firms, Miller and Coors, have agreed to joint distribution of their beers. Imperialism, the Highest Stage of Capitalism, by V. I. Lenin, 1917. Foster and Magdoff, The Great Financial Crisis, page 54. Note that mainstream economics defines monopoly as a single large firm dominating and industry, and an oligopoly as a few large firms. The Marxist term monopoly capital would include both, as in both cases the capitalists make extra profits from reducing output and raising prices due to their control of the market. Imperialism, the Highest Stage of Capitalism, by V. I. Lenin, International Publishers, New York (1939), page 106. See FRSO: National Oppression, National Liberation, and Socialist Revolution, 2004. In May 2010, the official unemployment rate was 15.5% for African Americans, 12.4% for Latinos, and 8.8% for whites. See National Income and Product Table 1.1.6. Real Gross Domestic Product, Chained Dollars (Billions of chained (2005) dollars] Seasonally adjusted at annual rates. Bureau of Economic Analysis, Department of Commerce. The 1970s were another period of economic stagnation, with four recession between 1969 and 1982, and high rates of inflation. The United States could well be entering another decade of stagnation. The Federal Reserve Bank or Fed is the U.S. central bank. Its main function is to stabilize the economy by raising short-term interest rates to slow the economy and limit inflation, and lower them during recessions to try to limit rising unemployment. During this last crisis, the Fed also played the role of “Lender of Last Resort” in bailing out large financial institutions such as the AIG insurance company. However, almost all of the Fed’s interest rate hikes to fight inflation have contributed to a recession, while recently the low interest rates to fight recession have resulted in asset price bubbles, such as the late 1990s Internet Stock Market boom and bust, and then the 2003-2006 Housing Market boom and bust. The Bursting of the Housing Bubble and the Coming Recession, By Dean Baker. Truthout, 17 August 2006. The term “Third World” began in the 1950s to describe the colonial and semi-colonial countries of Africa, Asia, and Latin America as opposed to the “First World” of the imperial countries and the “Second World” of the European socialist countries. In the 1960s and 1970s the term was also used to describe oppressed nationalities in the United States. The Bretton Woods conference in 1944 planned out the post-World War II international monetary as a more flexible version of the 19th century gold standard where currency values were measured in gold. This was one of the last contributions of the economist Keynes to the capitalist system. The official unemployment rate for Detroit in January 2010 was 25.3%, more than twice times the national unemployment rate of 10.6% (both rates are NOT seasonally adjusted). The official unemployment rate understates the economic pain to workers by not counting people without jobs who want to work but didn’t look in the previous month (discouraged and marginally attached workers), and those who are working part-time but can’t find full-time work due to the economy. In January 2010 the alternative unemployment rate including these other workers was 18% (not seasonally adjusted). Bureau of Labor Statistics. “Breaking up the Financial Industrial Complex,” by David Weidner, Wall Street Jouirnal, April 1, 2010. The United States is net debtor nation, that is, foreign-owned U.S. assets is are greater than U.S.-owned foreign asset to the tune of $7.9 billion. One advantage that the U.S. has in borrowing from abroad is that the U.S. dollar is the reserve currency used to do international trade in, so that other countries need to hold dollars to finance trade. Federal Reserve Flow of Funds Accounts of the United States, Flows and Outstandings, Fourth Quarter, 2009, Table L.107, page 69. The U.S. Federal government debt held by the public was about $8.4 trillion, or 53% of GDP (Gross Domestic Product, which is the total output of final goods and services in the economy, the standard measure of national production). With the annual Federal budget deficit running at about $1.5 trillion, or 10% of GDP, this figure will rise significantly. Economists generally use the debt held by public, net of bonds owned by Federal agencies such as Social Security, as the standard measure of government debt. The total or gross U.S. government debt is $12.9 trillion, or more than 80% of GDP. US debt from the U.S. Treasury at http://www.treasurydirect.gov/NP/BPDLogin?application=np and GDP is from http://www.economicindicators.gov. The Greek/Euro crisis of early 2010 also shows the limits of the Keynesian response to the latest economic crisis where trillions of dollars of government stimulus (much larger relative to the size of the economy than the 1930’s New Deal) were used to stop the downward spiral of capitalist economies. Countries throughout the Euro-zone and in Britain are now trying to cut their budget deficits, which will slow the recovery and possibly push it back into a deeper recession. The bailout of banks and capitalists who own Greek and other Euro-zone government bonds has meant severe austerity for Greek working people, especially government workers who are having their pay cut, taxes raised, etc. even as unemployment continues to rise. The growing movement in the U.S. government to “cut the deficit” is a call for more austerity for U.S. workers and poor people. Previous post Boycott Arizona! Say No To Racial Profiling!